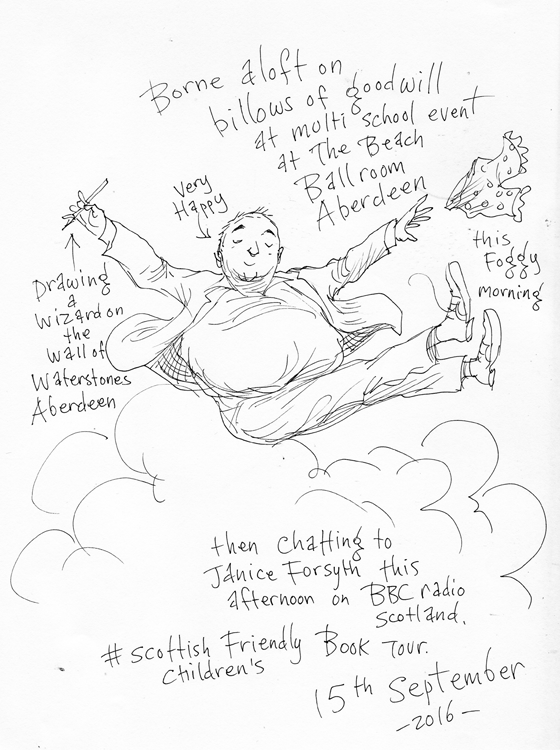 This September the Scottish Friendly Children’s Book Tour took amazingly talented illustrator, author and current Children’s Laureate Chris Riddell on a national tour of Scotland. What better way to tell the story of the week than through excerpts from his Laureate Log, in which he illustrates everything he does for his Laureateship. 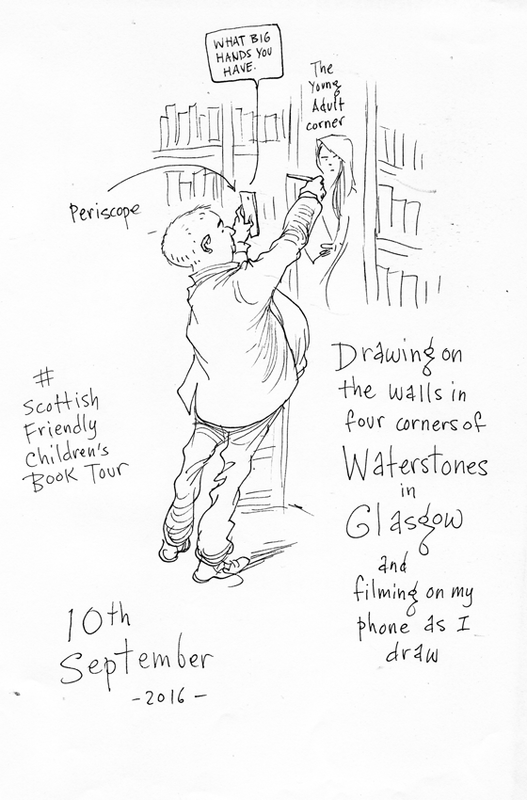 The week began at Waterstones in Glasgow where Chris was invited to draw on their walls – something he plans to do in Waterstones stores up and down the country! 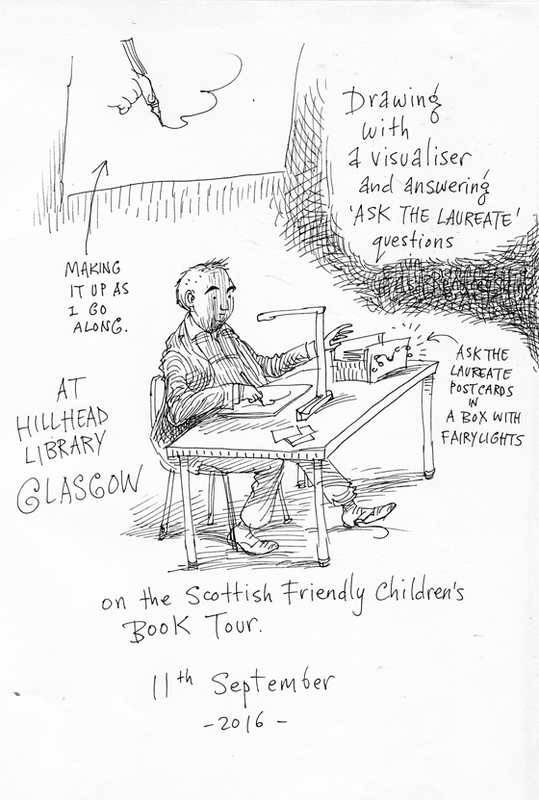 On Sunday we tried out our ‘Ask The Laureate’ event at Glasgow’s Hillhead Library. We used a visualizer, meaning Chris could live draw his answers to questions and everyone could see it on a big screen. On Monday we spent the day visiting Crookfur and Springhill & Auchenback Primary schools in East Renfrewshire. 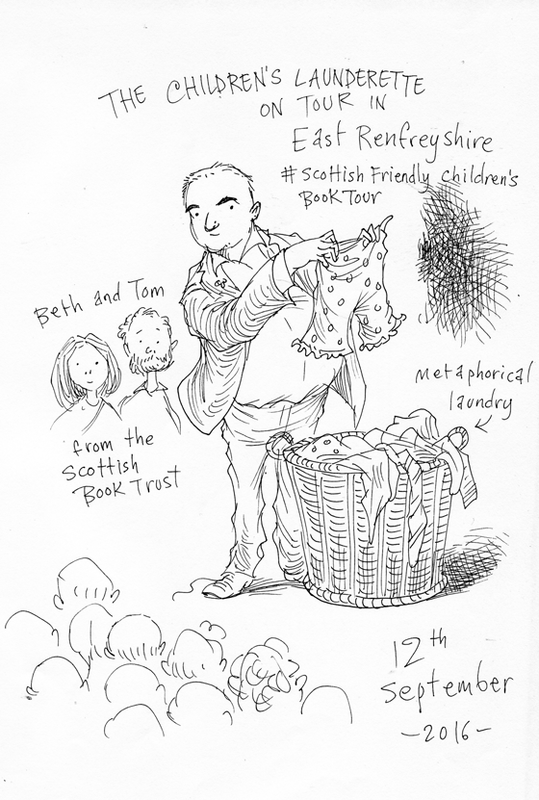 Chris told them all about his work as the Children’s Laureate, or Children’s Launderette as he is known to his friends! On Tuesday we visited Riverside Primary School and East Plean, who had undertaken an amazing world-building maps project and shared a dramatic trailer to introduce Chris’ visit! 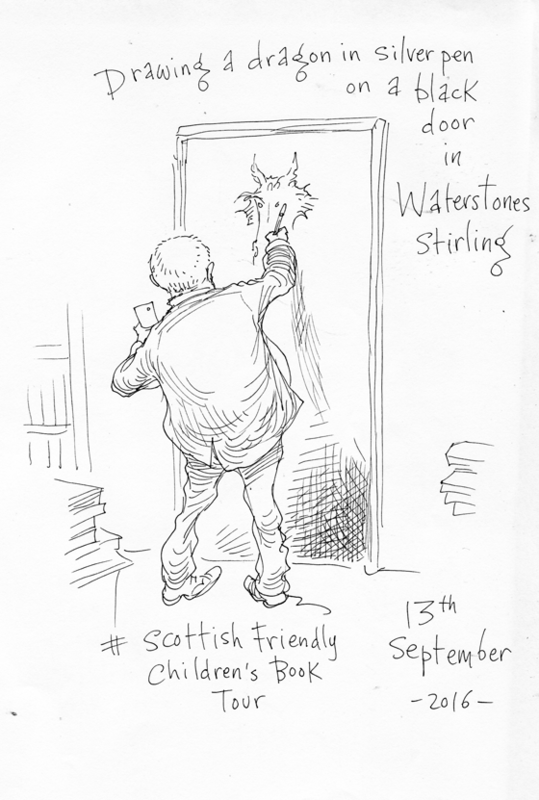 We went to Stirling Waterstones in the evening and Chris drew a huge silver dragon on their door. On Wednesday we visited beautiful Perthshire as Chris continued to valiantly answer hundreds of pupils burning questions such as: ‘what inspired you to become a writer’, ‘which of your books is your favourite’ and ‘Which would win – a fish riding a bike, or a bike riding a fish?’. However weird or wonderful, he illustrated the answers to as many as he could, telling stories while he drew. The schools got to keep the answers. On Wednesday night Chris visited Waterstones in Aberdeen and drew a wizard on their walls before we met the wonderful professionals from the Aberdeen Library Service, who helped us plan our big event at the Aberdeen Beach Ballroom. Our final day saw us put on a huge event with 1000 pupils from 22 local schools at the Aberdeen Beach Ballroom. Chris signed hundreds of books in a hurry so we could go to Newtonhill in Aberdeenshire for our final school event. Finally, we popped into BBC Radio Scotland Aberdeen for a quick interview with Janice Forsyth. A huge thank you to all the schools for their questions and projects and to Chris for a brilliant week. 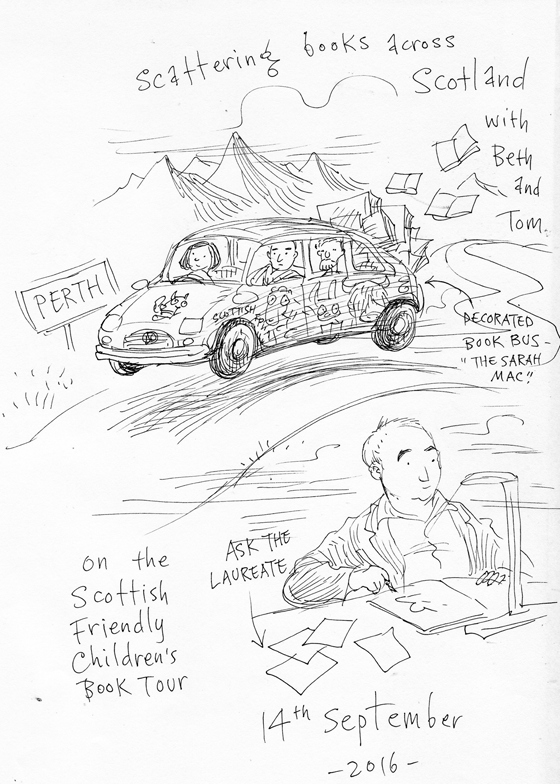 Over 1000 books sold – a Scottish Friendly Children’s Book Tour record! 3 Waterstones stores now adorned with Chris Riddell’s drawings. 32 schools attended events throughout the week!